The Big Lebowski is a very funny film where the wrong man gets caught up in a kidnapping incident due to sharing the name with another man. 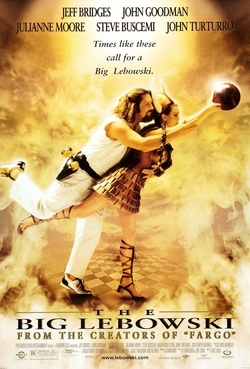 The ‘wrong man’ in this case is Jeff Bridges as Jeff Lebowski, more commonly known by his nickname ‘The Dude’. The film has become a massive cult classic, and you don’t need to have seen it to know a little bit about it’s protagonist. His character is laid out perfectly in an opening sequence featuring Sam Elliott’s narration, which introduces us to this lazy unemployed man, who spends his days sleeping, daydreaming and drinking white Russians, and his nights bowling with his two friends (if you can call them that) Walter (John Goodman) and Donny (Steve Buscemi). That narration is abruptly ended when two criminals break into The Dude’s apartment, force his head down the toilet whilst asking for the money he owes, before peeing on his rug and leaving. The rug is the thing that gets to The Dude the most, and this sets in motion the film’s plot when he seeks the real Jeff Lebowski to compensate him for the rug. The triumph of the film comes in the multitude of memorable characters that have been created and operate in this bizarre and weird world. There are roles for great character actors and Coen regulars such as the late Phillip Seymour Hofmann, Peter Stormare, Steve Buscemi and Julianne Moore, with the two standouts being John Goodman’s Walter and John Turturro’s magnificently unhinged pederast Jesus. Walter Sobchak is arguably John Goodman’s greatest character in a career of memorable characters and the hypocritical war veteran is the source of most of the film’s laughs. His rants about Vietnam, his love of rules and disregard for poor Donny are hilarious, and his dominant personality clashes perfectly with the normally relaxed Dude. The other standout, in a smaller role is Jesus Quintana (Turturro), who only appears in a couple of scenes but manages to make them as memorable as any others in the film. The film uses popular music as well as Carter Burwell’s score to tell the weird and wonderful story, and there’s a couple of scenes of outright surrealism through The Dude’s daydreams. The plot itself may be weird, but it it skilfully starts to make sense at the same time as The Dude starts to put the pieces together. To some extent it feels like a bunch of ideas were thrown at the screen in the hope that they’d come together, and to a large extent they do, which is testament to the steady hands behind the film and the quality of the acting at the front. By this stage in their career, the Coen Brothers had firmly established their own style and this is arguably the first film where their influences had come together to create something truly original. I don’t think it’s their best film, but it’s another truly enjoyable movie and their finest comedy (out of those I’ve seen thus far). I’ll be taking a 2 week break due to moving house, holiday and the World Cup! After that, next up will be ‘O Brother, Where Art Thou?’, a film I wasn’t particularly taken by on first viewing, so we’ll see what I think this time round!